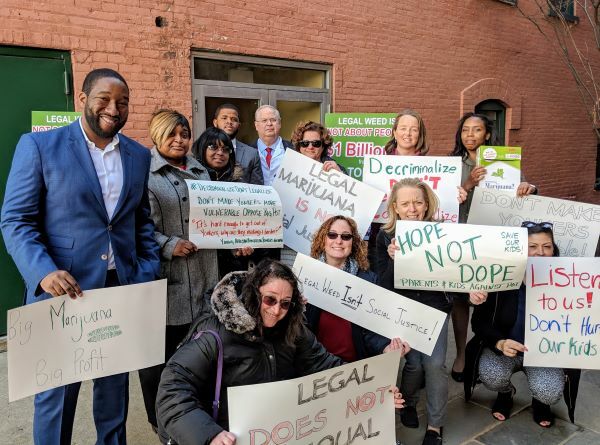 Julie Killian, second from right in front, was among the concerned New Yorkers at a SAM (Smart Approaches to Marijuana) rally outside Senate Majority Leader Andrea Stewart-Cousins’ Yonkers office on March 20. While ten states as well as the District of Columbia, have legalized recreational marijuana and many in New York State are pushing to follow suit, Julie Killian, co-founder of RyeACT, a federally-funded local anti-drug coalition, is cautioning elected officials, from the governor’s office on down, to consider the facts. In two interviews with the paper, Killian, the mother of five, emphasized that there are three distinct parts to any discussion about marijuana: medical, criminal, and legal. According to Killian, the revenues from legalization in Colorado haven’t gone, as promised, toward education. And the prison population hasn’t declined either. She also feels strongly that the State needs to hear from drug experts, “not the current rogue group of doctors working as consultants” who perform State studies. “Legalizing marijuana is not a big win for anyone,” she concluded.